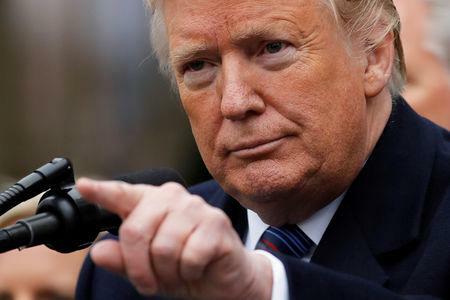 WASHINGTON/BEIJING (Reuters) - President Donald Trump on Friday downplayed a revenue warning by Apple Inc and said slowing economic growth in China puts the United States in a strong position as negotiators from the world's two largest economies prepare for trade talks next week. U.S. officials are heading to Beijing next week for the first face-to-face talks since Trump and President Xi Jinping in December agreed to a 90-day truce in the trade war as they sought to strike a deal. Beijing on Friday cut bank reserve requirements for a fifth time this year amid slowing growth at home and punishing U.S. tariffs on exports. Official data this week showed manufacturing has slowed in both China and the United States. Trump, who last month called himself "Tariff Man", has said he wants a deal but that he would impose more tariffs if China failed to cede on key U.S. demands. 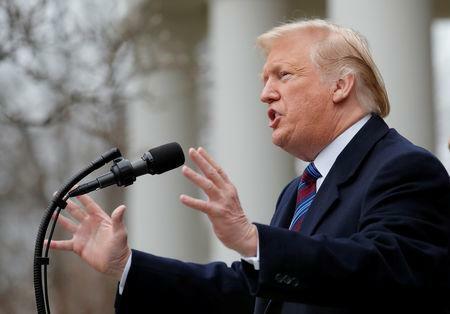 Trump downplayed the effects of the economic woes on U.S. technology giant Apple Inc , which this week blamed slowing iPhone sales in China behind a rare reduction in its quarterly sales forecast. Shares of Apple closed at $148.26 apiece on Friday, down about 5.1 percent this week. Apple shares fell 7 percent in 2018 but are still up about 24 percent since Trump took office in January 2017. Apple's outlook revision along with a double-digit drop in earnings at commodities giant Cargill Inc [CARG.UL] on Thursday may be among the clearest warning signs yet that the trade war's effects have begun to hit U.S. companies. A team led by Deputy U.S. Trade Representative Jeffrey Gerrish will travel to China for talks, China's commerce ministry said in a statement on its website on Friday, news that helped boost global markets. USTR said separately that the delegation would also include Under Secretaries from the U.S. Departments of Agriculture, Commerce, Energy and Treasury, as well as senior officials from those agencies and the White House. While Trump and other officials have said talks between the two sides are progressing well, they have given no details on concessions that China has made. Some U.S. demands would require structural reform that may be unpalatable for Chinese leaders. "We know what sort of changes we need," White House economic advisor Larry Kudlow said in an interview with Fox Business on Friday. "Now, the question is can we negotiate these changes and can we do so with enforcement (and) with timetables."